Needs battery other than that works good. Have 18v drill and charger, battery fried. Drill and charger still work just fine. Used PORTER CABLE 18V PC186CS 6-1/2-inch Cordless Circular Saw. Works with Lithium or NiCd Batteries. Comes with the owner's manual. No battery or charger is included. Drill, reciprocating saw, and charger.All work. 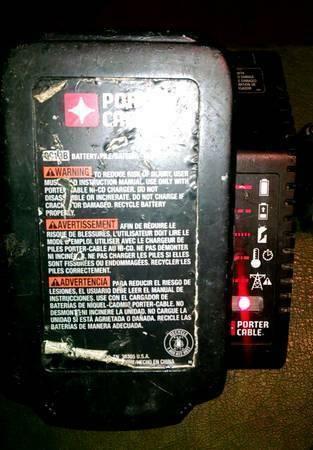 Batteries do not charge. Bare tools only. Porter cable 18v set for sale Saw,saw, drill, and circular saw. $ 30.00 cash. For all 3 items. Troy bilt tb20cs weed eater for sale In great condition $45.00 cash only Call or text show contact infoNo emails please.